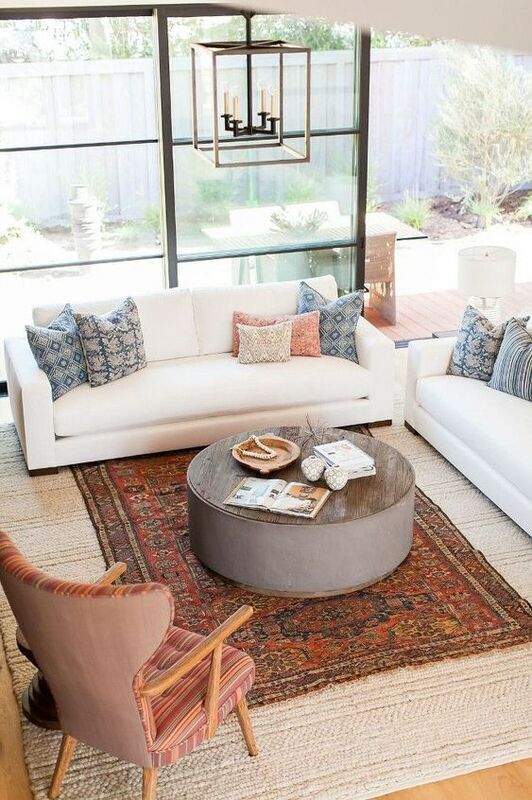 You may have noticed vintage rugs popping up all over Instagram lately. Full of lovely colors and eye-catching patterns it’s no surprise that they’re having their 15 minutes of Instagram fame. All these gorgeous pictures have also probably made you consider getting a vintage rug of your own. But how do you know what to look for? And what even counts as a vintage rug? A rug that’s 25 to 50 years old is vintage. Anything over 50 years is antique. 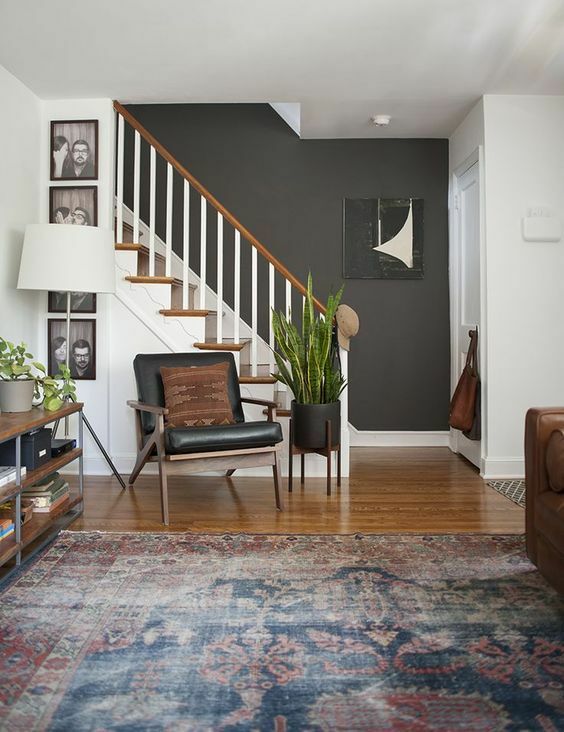 A vintage or antique rug can be a wonderful investment for your space, but you need to know what to look for to make sure you’re not getting ripped off. 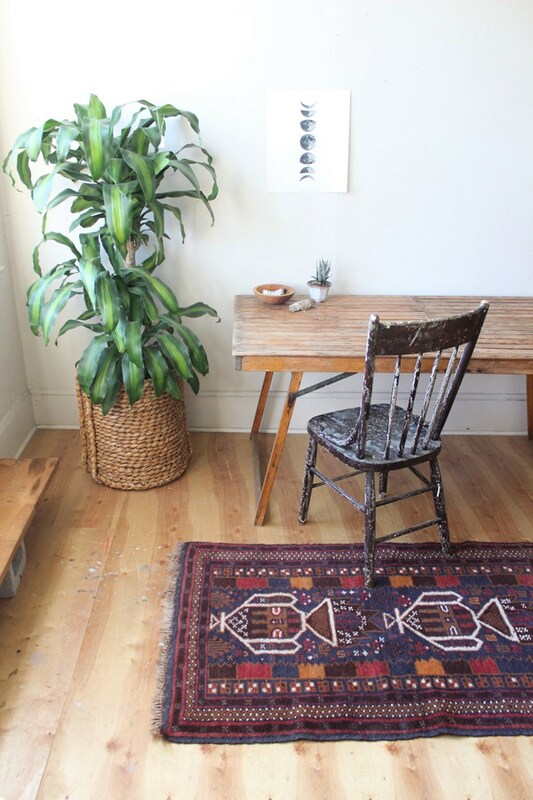 To help out with that, today we’re giving you a few tips for buying a vintage rug. To make sure you pay a fair price, and don’t get ripped off, it’s important to know ahead of time what you’re looking for. Quality vintage rugs are made from natural fibers fibers like wool, cotton, jute, and silk, and are hand-knotted and hand-woven. 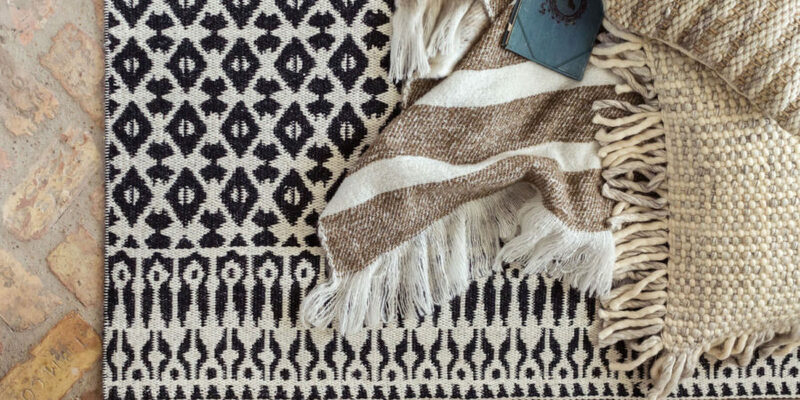 These techniques produce completely unique rugs with lovely variations. Research different styles and patterns to see what you like and think would look best in your space. It’s good to know and understand the common buzzwords of vintage rugs. These include “Persian,” “Oriental,” “Turkish,” “Moroccan,” “Kilim,” and “Oushak.” The more information you have going in the more likely you are to find a real treasure at a fair price. It can also help narrow your choices down a little bit if you’re looking for something more specific. A rug that’s 25 years older or more is going to have at least a little bit of wear. Unless it was hidden away in a trunk somewhere there’ll be some sign of use. Even if it’d been hanging as a tapestry it will likely have some fading from sun exposure. In fact if a rug has no wear this is a major red flag that it is not genuinely vintage. On the other hand, major damage is usually a deal breaker. Unless the rug is dirt cheap it’s not worth it if you’re going to have to spend a lot of money restoring it to a usable state. Unraveling edges are the hardest and most expensive part of a rug to repair, so be especially wary of loose ends. Obviously you’ll look the rug over to assess its condition, but your other senses come into play when choosing a vintage rug as well. Feel the rug. 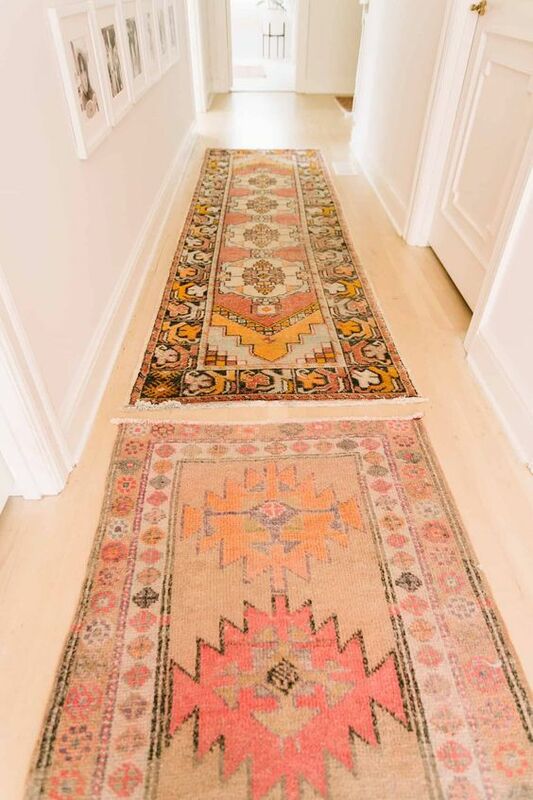 Genuine vintage rugs don’t have backings, so if the back of the rug feels a lot different from the front, move on. You can also listen to the rug to check for damage. Rugs that at one point had a deeply saturated stain that dried without proper cleaning will feel stiff and you can even hear it crack. This cracking means the fibers have rotted and the rug is not worth your time or money. The one sense to not rely on too much is smell. Most vintage things tend to have a bit of a strange smell to them when you first buy them. So unless a rug smells knock-your-socks-off funky, a slight odor isn’t worth passing on a rug over. While you may have a vision in your mind of the perfect rug, remember that it’s going to be difficult to find exactly what you’re looking for when you’re dealing with pieces that haven’t been massed produced. The main issue you’ll likely run into is size. Since handwoven rugs are sized to the loom used to create them they probably won’t be the exact size that you’re looking for. Unless it’s just way too big or way too small this is an easy enough problem to work around however. 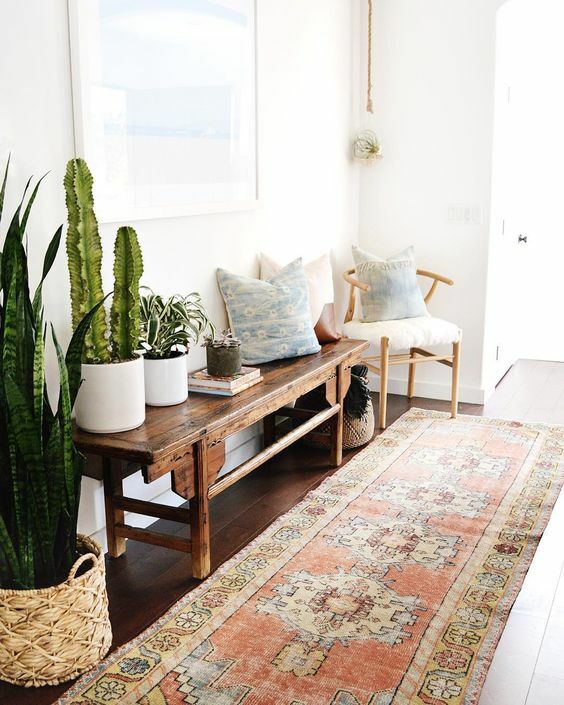 Simply layer the rug over a jute or other neutral rug that is the correct size for the space. Sometimes the hardest part of shopping for vintage is knowing when to say no and let something go. You might love the way a piece looks, or the idea of the piece, but if the condition is too bad it’s generally for the best to pass on it. Unless you’re getting it to hang as a tapestry, it still has to function as a rug, so any pieces that look threadbare should be skipped. As mentioned previously, you’ll also likely have to pass on rugs with unraveling edges since the repairs will be costly. It may be hard, but remember that by not spending money on a piece in poor condition you’ll be saving it for a piece that will be even better. 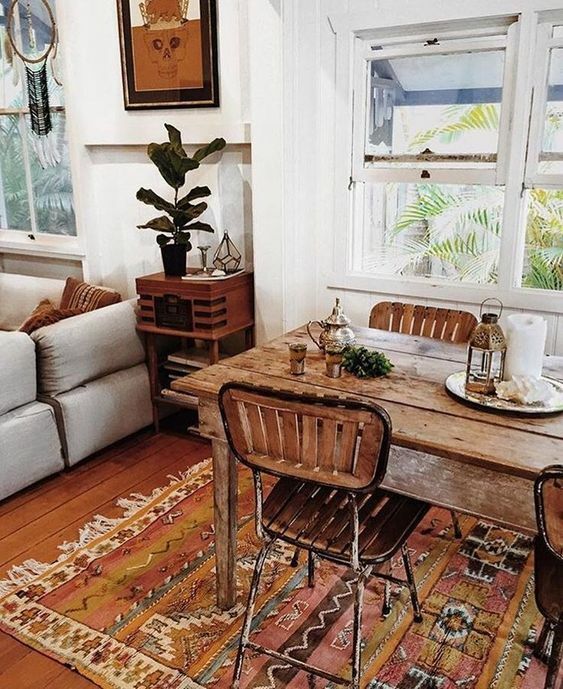 A vintage rug is a great way to add real character to a space. Since they were hand made, each rug is unique and you can know you have a piece that no one else does. Perhaps the best part of a vintage rug is, you don’t really have to wonder about its durability, since it’s already survived for this long. A rug made of quality materials using the proper techniques can last centuries if treated properly. If you happen to be in the market for a vintage rug and in the NYC area, stop by our Chelsea showroom to peruse our selection of authentic vintage rugs. And if vintage rug shopping has given you the vintage bug, make sure to check out our tips for thrift store shopping!